We don’t know too much about what He prayed during those times. The passage in Luke 6 suggests that He prayed about His choice of the apostles; and in the other Lucan passage, it was His prayer of agony before the crucifixion, which is also recorded in Matt. 26:39ff and Mk. 14:35ff. In John’s Gospel, The Gospel of Love, we have recorded what is sometimes known as the High-Priestly Prayer of Jesus. 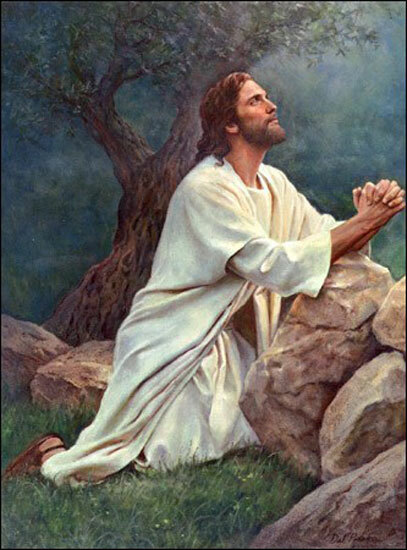 I usually refer to it as the Lord’s Prayer, because this is a lengthy recording of Jesus’ prayer for us. And, yes, it is a prayer of intercession by our High Priest on our behalf. "When Jesus had spoken these words…"
What words? The preceding words recorded in John 16:19-33. After He spoke those words, He then turned His attention toward the Father and began praying for those to whom He had just preached. This transition reveals His ministry as both prophet and priest (Lk. 13:33; Heb. 3:1). If we are to follow in His steps, then it is necessary that we not be content with simply telling others the good news, but we must also pray for those to whom we preach. When He had spoken to them FROM God, He then turns and speaks TO God for them. We should be satisfied with no less. Notice that Jesus says the Father has given Him authority over ALL flesh, but He only gives eternal life to those whom the Father has given Him. Who are the “all” that the Father has given to the Son? If we are part of those who have been given to the Son, then that should cause our hearts to soar with gratitude and adoration. You are a gift. I am a gift. We are gifts given to Jesus. He cherishes and shows appreciation for that gift by giving us eternal life. The Father loves you enough to have called you out of the way you were going and bring you into the kingdom of the Son of His love (Col. 1:13 NASB footnote). What does that phrase mean to you? Is the first thing that comes to mind is that you will live forever? While living forever is certainly an aspect of eternal life, it is not in itself eternal life. Eternal life, as defined and explained by Jesus, means to know God, and Jesus Christ who was sent by God. The word “know” translates the word that means to know by experience, to know intimately. It is not the mere perception of something or someone, but the full knowledge that comes from being in their presence. That quality of life began the day you were born again and will continue beyond time. You are growing in your knowledge, grace and experience of the Lord, aren’t you? (2 Pet. 3:18) It is not something that hasn’t changed for you in the past few years, I hope. Eternal life is a quality of existence that makes getting up every morning worthwhile.